The Presidential Medal of Freedom is the highest civilian award in the United States and is bestowed by the President of the United States. It is designed to recognize individuals who have made "an especially meritorious contribution to the security or national interests of the United States, world peace, cultural or other significant public or private endeavors." Though a civilian award created by executive order (rather than by a decision of the Joint Chiefs of Staff), the Medal can be bestowed upon (and worn by) military personnel. The Presidential Medal of Freedom ranks second only to the Medal of Honor issued by the United States Congress, which is the nation's highest military award. Unlike the Medal of Honor, the Presidential Medal of Freedom is generally not awarded for solitary actions. The award is conferred only after careful deliberation of a lifetime of service from a distinguished career. Medal and other accessories including undress ribbon, miniature, and tie clasp. The Presidential Medal of Freedom is a two-inch pendant suspended from a blue ribbon featuring a five-pointed white star set against a red pentagon. In the center of the white star is a blue disc trimmed in gold and harboring a constellation of 13 gold stars. A gold eagle is placed between each pair of the star points. The Medal is presented in a distinctive walnut case. Each recipient receives a personalized certificate signed by the President citing the achievements that led to recognition. 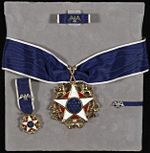 A special grade of the medal, known as the Presidential Medal of Freedom with Distinction, has the medal worn as a star on the left chest; in addition, the ribbon is worn as a sash on the right shoulder, with its rosette (blue with white edge, bearing the central disc of the medal at its center) resting on the left hip. The medal may also be worn on the ribbon on the left chest, with a silver American eagle with spread wings on the ribbon (or a golden eagle if a medal With Distinction). The Presidential Medal of Freedom was established by President Harry Truman in 1945 to honor service during World War II. Anna M. Rosenberg—began her specific association with defense-related labor issues in the early 1940s with appointments to the Manpower Consulting Committee of the Army and Navy Munitions Board and the War Manpower Commission. This experience was deepened in July 1944 when President Franklin Delano Roosevelt sent her to Europe to make manpower observations about the American military. For her service to Presidents Roosevelt and Truman, Rosenberg would be awarded the Medal of Freedom. Andrée de Jongh—with the help of her father, Frederic de Jongh, established the Belgian escape network for returning fighting men, particularly shot down airman, to Britain. The route (known as the Comet Line) went from Brussels, through France to the Pyrenees, then Bilbao before arriving at the British consulate in Madrid. Marie Louise Dissard—She was 60 when she joined the French resistance. She became the leader of an escape route with stations in Paris, Marseilles and Perpignan, helping 250 airmen out, 110 of them while she herself was in hiding. Before that, she traveled through France, looking like any other elderly woman, arranging lodgings, accompanying escapees and setting up contacts. President John F. Kennedy revived the medal in 1963 through Executive Order 11085, and expanded its purpose. President Ronald Reagan presents Mother Teresa with the Medal of Freedom. The revival began in 1962 following a Gallup poll indicating that Americans favored the establishment of some sort of National Honors List to recognize individuals who made outstanding contributions to United States life in such endeavors as the arts, science, literature, education, religion, or community service. Within three months of the release of the poll results, President Kennedy created the Presidential Medal of Freedom. Kennedy announced the first 31 recipients on July 4, 1963. However, Kennedy never got the chance to present the medals. The ceremony was repeatedly postponed because of design disagreements between the president and the first lady. It was finally scheduled for Dec. 6, 1963, but Kennedy was assassinated just two weeks earlier. Fourteen days after Kennedy's death, it fell to newly inaugurated President Lyndon Johnson to bestow the awards on American icons like African-American singer Marian Anderson and labor leader George Meany—as well as a posthumous medal to the fallen president himself. Johnson also had a medal engraved for Jacqueline Kennedy, but she declined hers. United States President George W. Bush (right) stands with Presidential Medal of Freedom recipients, Vinton G. Cerf (left) and Robert E. Kahn in 2005. They were honored for their work in helping to create the modern Internet. The medal is awarded annually, on or near the Fourth of July, and at other times as chosen by the President. Recipients are selected by the President, either on his initiative or based on recommendations. The order reviving the medal also expanded the size and the responsibilities of the Distinguished Civilian Service Awards Board so it could serve as a major source of such recommendations. Unlike many other U.S. awards, the Presidential Medal of Freedom can be awarded to non-U.S. citizens. The medal may be awarded to an individual more than once (for example, John Kenneth Galbraith and Colin Powell), and may also be awarded posthumously (for example, John F. Kennedy and Roberto Clemente). Another award that is considered its equivalent is the Congressional Gold Medal, which is bestowed by an act of Congress. The second highest civilian award in the United States awarded by the President is the Presidential Citizens Medal. More than 30 people have won both the Presidential Medal of Freedom and the Congressional Gold Medal. Nazi war criminal prosecutor Simon Wiesenthal joined those ranks in 1999. Wiesenthal earned the Congressional Gold Medal in 1980. Pittsburgh Pirates baseball Hall of Fame member Roberto Clemente and Dorothy Height have been awarded all three prestigious medals—the Presidential Medal of Freedom, Citizens Medal and Congressional Gold Medal. The total number recipients now exceed 20,000. For a complete list of winners go to Presidential Medal of Freedom Recipients. ↑ 1.0 1.1 The Presidential Medal of Freedom History, Medaloffreedom.com. Retrieved May 28, 2008. ↑ Executive Order 9590, signed 21 July 1945; Federal Register 10 FR 9203, July 25, 1945. ↑ 1945 U.S. Medal of Freedom Recipients Medaloffreedom.com. Retrieved May 31, 2008. ↑ Medal of Freedom Medaloffreedom.com. Retrieved May 28, 2008. ↑ Dual Winners Medaloffreedom.com.Retrieved May 28, 2008. Presidential Medal of Freedom Recipients Infoplease.com. History of "Presidential Medal of Freedom"
This page was last modified on 28 May 2015, at 19:42.